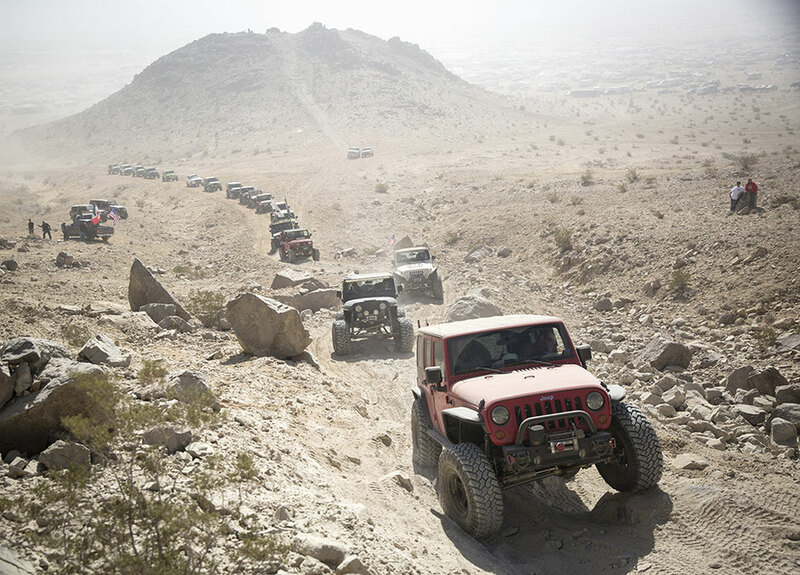 Who wouldn't like to drive the King of the Hammers race course with their Jeep? Thanks to Tony Pellegrino and GenRight Saturday 9 February is possible. This is your chance to drive on the actual King of the Hammers race course, right from the starting line! Follow Tony Pellegrino from GenRight Off Road in your Jeep on the very same path that the Unlimited Class race cars tore up the previous day. Along the way, Jordan, Jami & Tony will be telling stories from race day at each section of the course or obstacle. We will be taking you to remote areas of the Johnson Valley OHV area, where most people have never been. You will experience the Hammers like you have never seen before! Check in will be at the Mickey Thompson Tires semi truck Saturday morning February 9 between 8:00am at 9:30am. The run will depart at 10:30am. Tony will be leading the trail run in his Jeep JK so he can interact with everyone on the trail. The nice folks from Vision X and Rockstar Garage will be out on the race course at a remote location to serve the entire group a BBQ lunch. All registered entrants will receive an event-exclusive KOH Experience T-shirt, BBQ Lunch, Participation decal, raffle ticket, a swag bag full of fun stuff from all GenRight Off Road and other companies. VisionX will be raffling off 5 sets of their Vortex LED Headlights! Sorry, NO stock vehicles, and this should not be your first time off-road either. We recommend 35” tires and lockers. Smaller tires (33’s) can make it, but it’s the Hammers! Your undercarriage will never be the same! Tony will be talking on the race radio the entire time we are driving. Bring a camera, warm clothes (you never know what the weather will be like) and some trail snacks (including water) to get you through to our lunch stop. The run will take place rain or shine! Factory Reps from GenRight, Mickey Thompson, VisionX, Rugged Radios, Money Pit and more will be throughout the group, to keep the group together. We expect to be back in Hammertown from the run by 4pm. Entry fee is only $30 per person and space is limited. A confirmation email will be sent to you with more details, and a discount offer on select products. Sign up to be part of the 2019 GenRight/VisionX KOH Experience Run presented by Mickey Thompson Tires!